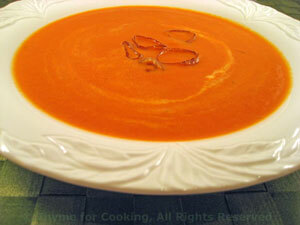 Pimiento Soup with Mascarpone, Thyme for Cooking simple pantry soup. A simple soup, made with pantry ingredients, bursting with color and flavor. Peel shallots and slice into rings. Heat oil in a small saucepan. Add shallots and sauté until starting to brown and crisp. Select a few of the nicer ones for garnish, remove and set aside. Drain pimentos and add to saucepan. Add tomatoes and their juices along with the paprika. Gently stir in mascarpone but not completely, leaving swirls of white. Serve, garnished with reserved shallot rings.